The history of the Lloyd Stueve family is rooted in agriculture. About four generations ago his ancestors arrived from Germany. They came here as Germans but became American farmers, citizens, and Christian leaders in their communities. Beginning in 1839, on a farm in Missouri, the Stueves learned to clear thick forests so they could cultivate, plant and raise cows, chickens and pigs, using plow horses to do much of the work. Later, many of Lloyd’s father’s generation, Harold J.J. Stueve, followed him and his two uncles, Elmer and Ed to southern California to establish, in time, one of the country’s largest family owned dairy farms, Alta-Dena Dairy. Today the Lloyd Stueve family is continuing the farming tradition in the central valley of California. His family works hard to produce quality, healthy, organic products for consumption. These products are produced on their Certified Organic farm with emphasis on organic milk, beef, eggs, and olive oil. The cows, chickens and beef animals all graze on the pastures this farm encompasses bringing omega 3’s, CLA’s, non-GMO qualities to the foods. We all hope you will enjoy not only the taste and nutrition of these products but also that you will appreciate the time, effort and passion that it took to produce them. Our eggs are on native ground that has never been sprayed with pesticides. We only treat and feed organically. 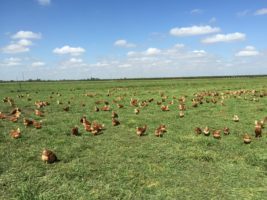 With our chickens being in the pasture and rotating every other day gives the chickens a new, fresh area for feed (grass, clover, fly larve, grubs and other insects), and also keeps their area clean. We supplement their diet with a high quality feed from a local custom grain milling facility. Our belief is producing the highest quality egg for consumers to enjoy and know that what they are putting in their body is the best. With our operation being mobile everything has to be brought to them ie. Feed, fresh water, etc.